Sleek design will add a sophisticated, modern touch to your office desk. Features Bluetooth® wireless for short-range data transfers at up to 30 feet. Blue LED technology lets your mouse function on a wide range of surfaces. You can work from almost anywhere. Up to 16 months of life on a single AA battery! Battery life will vary depending on the product configuration, product model, applications loaded on the product, power management setting of the product, and the product features used by the customer. As with all batteries, the maximum capacity of this battery will decrease with time and usage. Battery is included. It’s time your accessories matched your individuality. Meet your new wireless mouse1, carefully crafted to bring its unique slim style to your work. It’s functional. It’s portable. It’s fashionable. It’s yours. 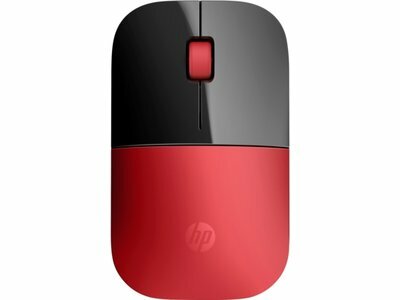 With up to 16 months of life on a single AA battery2, this mouse was designed to push the limits. 1,200 optical sensors give you exceptional accuracy and incredible speed. Just pop in the battery, plug in the USB receiver, and you’re good to go. No need to install anything. The USB receiver fits conveniently inside the mouse, for effortless portability. Supports Windows 7, 8, 10, Mac OS 10.3 or later, and Chrome OS. Rest easy with an HP standard one-year limited warranty. llewophnoj: Will not work. Poorest excuse for a mouse I have ever purchased in the last 40 years of using computers. Marspars55: It works fine but isn't comfortable. Also really, really, really noisy clicking. I replaced it because I couldn't stand the loud noise. This mouse is to small and light. Roy44: This mouse is quite small and light. It does not fit a larger size hand and moves at the slightest touch. 1 Wireless connectivity up to 30ft (10m). 2 Batterylife depends on usage.